It began with meeting Brian of Ramen Adventures at one of the most talked about ramen-ya's in all of Tokyo--Ivan Ramen. Brian was a cool, down-to-earth guy that undoubtedly enjoys ramen as much as I do. One of the best parts of having this blog, is being able to connect with people from all over the world based upon a single similarity. Today's experience was one not to be forgot! You might remember my last visit to Ivan Ramen. The ramen (and its owner) left such a great impression that I would often dream about returning. The experience at Ivan Ramen can be special on multiple fronts. The food is outstanding and you'll leave with a great sense of Ivan's passion, as well as, feeling like you've made another lifelong friend. 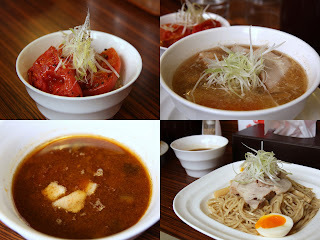 Brian ordered the Shio Everything Ramen (top-right) and the Buta Roasted Tomato Meshi (top-left). I could spill the beans, but I won't. You'll just have to wait for his review. I ordered the Syoyu Everything Tsukemen. To be honest, I've been wanting to try this for a long time. The noodles (as with all Ivan's noodles) are freshly made in the prep room behind his kitchen. What sets these noodles apart though, is that they're made with rye flour. The tsukemen dipping sauce is also remarkable. Full of rich flavor that won't give you the feeling of being weighed down, a spicy hint that lurks in the background is what makes it magical. After the three of us conversed for awhile about the overall joys of ramen, I got Ivan to sign a copy of his book. Talk about cool!! I'll definitely be back! The rest of my day was spent reconnecting with old friends in Fujisawa, about an hour and a half south of Tokyo. I ate ramen at their favorite hangout (not a ramen-ya), ate some awesome French Toast atop Enoshima Island, and basked under the beautiful Sakura in Kamakura. My grandparents used to live in Kamakura, so it was nice to be back in city filled with my childhood memories. One more day until I leave for Hokkaido. Ivan gave us some great recommendations so I might just have to try one before I depart. After all, he was the one who recommended Bassanova! The more I learn about Ivan and his ramen I become even a bigger fan. And this is before having a chance to try it! To me he's got it all. The concept and kodawari but also the vision to try something different. Most important he's so passionate. All this is making me passionately hungry. I agree. He even has a new soupless tan tan men concept. I'd like to go back and try it. And he promises to have a whole new lineup of cold noodles for summer. Dang.. sounds all fantastic. Forgot to mention btw, great photos! hah i picked up ivan's book too, after visiting his shop though. you beat me to the signage!! @rameniac: Did you want me to get you one? I was planning on going back towards the end of my trip. Hi Jenn. It is unbelievably beautiful. You would love it here. Ivan Ramen looks to be THE PLACE! :) Seriously, though, it's really sad (as you said)... even the worst places I tried in Japan (so far) have been better than the best stuff in So Cal. There's a level of quality, execution and pride going into each bowl of magic. That Buta Roasted Tomato Meshi looks great. The Hanjyuku Tamago!!! Are you kidding me?! :) Sigh.